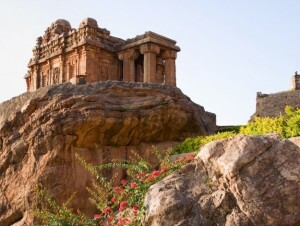 Badami Cave Temples: Badami was the erstwhile capital of the Chalukya Empire of south India. The town is situated in North Karnataka and is well known for its magnificent carved cave temples, artificial lake, museums and rock-cut into a crag. Famous fourBadami Caves cave temples- the main attractions of the town are carved out of sandstone on the cliff of a hill. There are also number of temples dotted on the bank of reservoir dedicated to Lord Vishnu, Lord Shiva. and Mahavir Swami. The Chalukyas are to be credited for creating a new architectural style that can easily be visible in these temple architecture and sculptures of god and goddess. including the Lajja-Gauri images of fertility cult, which flourished in the era. History: The rich past of Badami is closely linked with the ancient Kingdom of Chalukyas which date back to 600 and 700 AD. Chalukayas built number of temples, and other monuments that marked the beginning of the Hindu style of architecture. This new style was the blend of two distinct architecture – the Indo-Aryan Nagara style and the Dravidian style. Known as the Chalukyan style, this style is apparent in many cave temples, dedicated to Brahmanical deities, as well as the many Buddhist and Jain monasteries in the region. Towards the medieval period, Badami was ruled by Adil Shahi ruler of Bijapur and Marathas. Badami was finally taken over by the British, who made it a part of the erstwhile Bombay Presidency. Architecture: The Chalukyan style of architecture is quite evident in the cave temples of Badami. These famous temples are carved Badami Cavesout of sandstone housing a shrine, a hall, an open verandah and pillars. The exquisite carvings and sculptures make these cave temples noteworthy. Badami town also girds a number of carved monuments and other temples located on the bank of the reservoir. The freestanding stone temples in Badami, is a specimen to the evolution of the Chalukyan style of architecture. The Ladkhan temple at Aihole is another example of the Chalukayan architecture. The next phase of development is visible in the Gowdaragudi temple, which is a more complex structure. Among the many magnum opuses to be found in these caves, the magnificent 18-armed Nataraja the manifestation of Lord Shiva erected in 81 imposing poses is a marvel created out of carved stone. 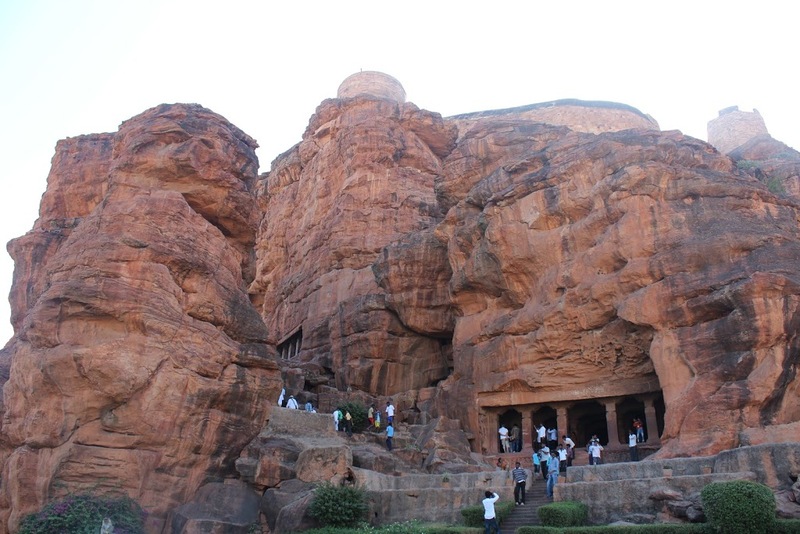 Architecture of the Cave 4 – a Jain Temple in Badami is just awe-inspiring. The 24th Tirthankara- Mahavira, is seated in a uniquely comfortable pose here, against a cushion in the inner sanctum. The shrine of Nagamma, the local serpent goddess, within a massive tamarind tree is another example of the architecture. exquisitely crafted. On the ceiling one can see the paintings of passionate couples. Cave 02: The second cave is perched on a sandstone hill. Lord Vishnu is the holy deity of this cave manifested as a dwarf or Trivikrama. Lord is in the position of conquering the Earth by his one foot and rules the sky with his otherBadami Caves foot. The temple also showcases Lord Vishnu as a ‘Varaha’ or as a boar, riding the Garnda all surrounded by beautiful lotus flowers. Cave 03: The third cave is about 70 feet wide a masterwork of 6th century. The delicate creativity and image astuteness are the prominence of the cave showcasing the ancient art. The art depicting ancient dresses, jewelry, hairstyle and the lifestyle of the glorious past will leave one mesmerize. The high alleviation of Vishnu manifested in many forms – Vishnu with a serpent, Vishnu as Man-Lion, Shiva Vishnu and Vishnu as Trivikrama are the other attractions of the cave. Cave 04: Cave fourth is dedicated to Jain Thirthankaras. They are the Jain caves lying towards the east of cave-3. The main attraction of the cave is the sculpture of Lord Mahavira decking the shrine besides the images of Padmavathi and other Thirthankaras. The cave also leads towards the southern part of Badami Fort, after climbing few steps a cranny is formed between Cave II & III, that leads to the fort where an old gun placed by Tippu Sultan is an attraction in itself. Accessibility To Badami Town: These famous caves can be reached by means of air transport, rail as well as by road. The nearest airport is Belgaum -150 km. On can also take up rail coach to Badami that is well connected to Bangalore. The local and tourist buses are also run from all over the state to Badami. Hubli -128 km, Bijapur -163 km and Bangalore – 550 km.